Appearance: Reddish copper with thin, frequent legs. Nose: Alcohol, oak, vanilla. Toned down a little with water. Palate: Hot. Alcohol, leather, vanilla. A little tamer than at full strength. Starts sweet but dries into a bitter char note. Finish: All alcohol. Pretty tasty with water. Drying with oak and vanilla. Lingers a while. Parting words: Beam Suntory has been experimenting a lot lately. Most of that has been with Jim Beam, but some of it has spilled over into Maker’s. First Maker’s 46 and now this, Maker’s Mark Cask Stength. 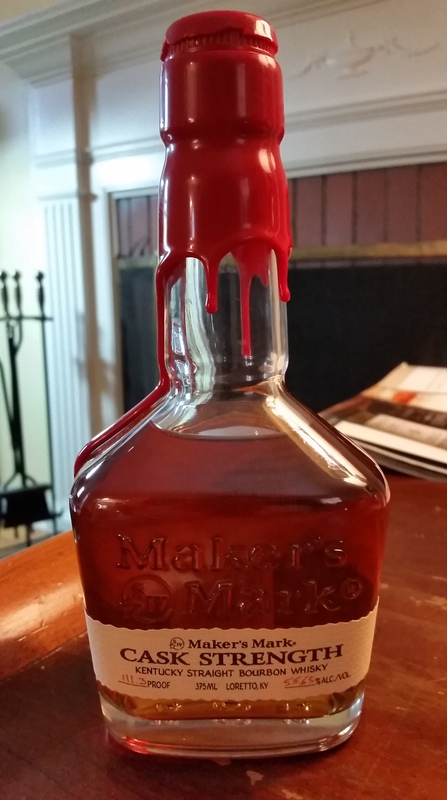 Maker’s had a 101 proof expression at one time (although I think it was only available overseas) but other than that, high proof has never been something that Maker’s has really done. what’s the point of watering a cask strength bourbon down to standard strength? There’s certainly no price savings here. Tasting makers at cask strength was interesting but not interesting enough to make me want to buy a second bottle. Maker’s Mark Cask Strength is mildly recommended. Note: I received an informal tequila tasting from a Binny’s staff member before purchasing this bottle. Nose: White asparagus with hollandaise sauce, alcohol, lime peel, cane sugar, whiff of smoke. Palate: Full bodied and rich. Agave syrup, tangerine, orange slice candy, burn. Finish: Lime pulp, white pepper, burn. Parting words: La Alteña is best known as the home of El Tesoro tequila, although it makes a few other brands including our friend Tequila Ocho here. Tequila Ocho was developed by Carlos Camarena of the Camarena tequila dynasty in partnership with Tomas Estes as a single-estate (rancho) tequila made using traditional methods. Binny’s has a tradition of excellent whiskey selections that has now extended into tequila, a spirit that their whiskey staff is also passionate about. As a tequila novice, I found this to be accessible with lots of typical character, but not boring. In spite of being cask strength, it’s subtle and sophisticated with seamlessly integrated vegetal, citrus and sweet notes and aromas. The price is almost impossible to beat, too. Binny’s Single Barrel Tequila Ocho is highly recommended. Notes: Natural color, unfiltered. Limited edition: Casks 108 & 166. Appearance: Pale gold with thick legs. Nose: Lemon pepper, peat, vanilla. Palate: Full bodied. Lemon Meringue, peat, then burn and a touch of gravel. Finish: Lots of heat and smoke. Hot but enjoyable. Parting words: OK, so the name of this one doesn’t exactly roll off the tongue, but it is delicious. I’ve had English Whisky Co.’s Classic Malt in years past and it struck me as whisky with lots of potential, but nothing impressive. This is impressive. It easily goes toe to toe with entry level peated Scotches without being an imitation of peated Scotch. The sweet citrus notes in the nose and on the palate set it apart from Islay and other attempts at peated spirits from outside of Scotland. $70 for a cask-strength peated whisky this delicious is a steal. There are only a few bottles left (mine is #405 out of 426) so run to Binny’s immediately and grab yourself a couple. English Whiskey Company Cask Strength Binny’s Handpicked Dual Cask Peated Single Malt is highly recommended. BBD: 10 yrs, 11 mos. TPS: 10 yrs, 3 mos. GBS: 11 yrs, 5 mos. TPS: A little lighter with more orange. GBS: Somewhere between the two (which are pretty similar anyway). BBD: Leather, peanut brittle, cumin. TPS: Big oak, touch of caramel. GBS: Oak is just as big, but with more spice. Chili powder, Tabasco sauce. BBD: Sweet and creamy on the palate, like vanilla toffee chews. TPS: Sweet and creamy too, but not quite as rich. GBS: Similar mouthfeel to BBD and just as sweet but more complex with Mexican chocolate flavors. TPS: The oak carries through in the finish but with enough caramel to round it off. GBS: Best of the bunch. Smoky chocolate and toffee. Parting words: OESO is one of the most popular of Four Roses’ ten recipes for retailer and private selections, as this tasting illustrates. The E indicates the lower rye mashbill and the final O indicates the O yeast was used in fermentation. The O yeast is known for contributing a “robust fruitiness” to its offspring. These bourbons are all quite robust but not much was there in the way of fruitiness. They are all very similar, as one might expect, but some of the subtle differences surprised me. I arranged the tasting the way I did, because I assumed that the TPS and the GBS would be closest in flavor but they weren’t. They were rick neighbors and came out at similar proofs but they ended up being the least alike of the three. The closest in profile were the BBD and GBS barrels. There were subtle differences between them but I highly doubt I could win a Pepsi Challenge scenario with the two of them. The TPS barrel was the outlier. It is the youngest, but it was the woodiest of the three. 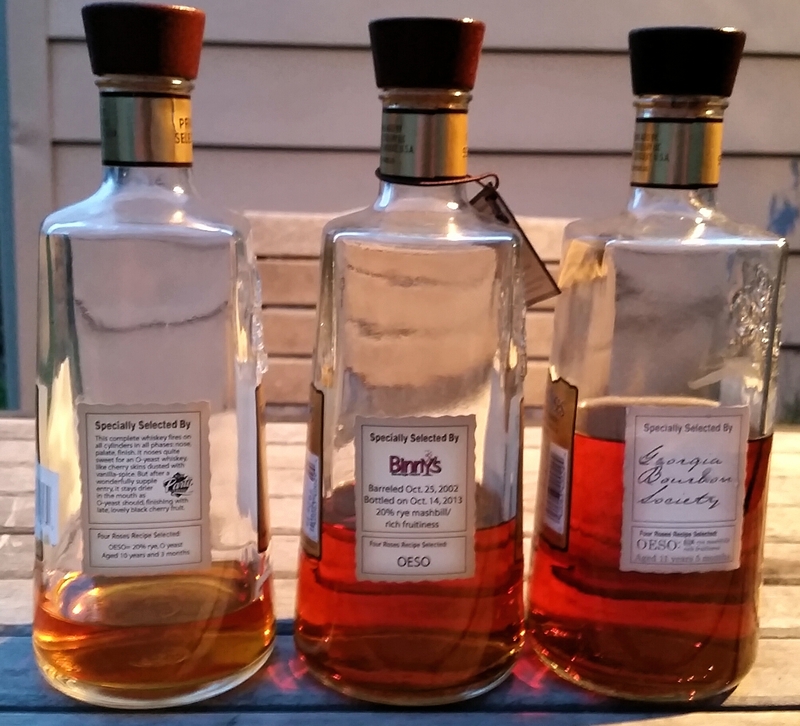 All three were very good, but the edge here goes to the product of the GBS barrel (which I and some friends of the blog helped select). The GBS selection was not for sale to the general public, but any GBS member would be happy to pour you some if you ask nicely. All are highly recommended. Appearance: Auburn with thin, evenly spaced legs. Nose: Taffy, alcohol, lavender, leather, fresh basil, roasted corn. Palate: Sweet and hot, but rounded. Rock candy and oak. Opens up but weakens with water. Butterscotch candy, tarragon, touch of char. Finish: Table grapes, cut grass, alcohol, caramel corn. Parting words: Booker’s was created by and named after Booker Noe, grandson of Jim Beam and father of Fred Noe, current Beam brand ambassador. According to marketing materials, this is how Booker drank his bourbon: uncut and at 6-8 y/o. 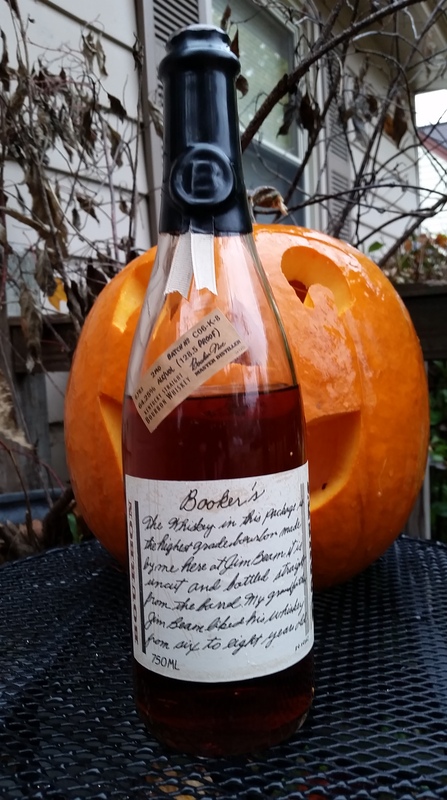 Booker’s was one of the first high-end bourbons I ever tasted and it was one of my favorites back then. I’ve had it a few other times over the years and it’s always been one I’ve enjoyed. This one doesn’t seem as good as ones I’ve had in the past. It has more of the less desirable aspects of the Beam character than past bottles, especially with water added. I’m not sure if it’s worth the price, especially considering that Knob Creek Single Barrel at 120 proof is only $46 and Baker’s is $47 at a lower proof and higher age. I’m not sure if a few more proof points and a pine box (perfect for Halloween) is worth the extra scratch. Still, it tastes good and that’s the most important thing, right? Booker’s is recommended. Appearance: Medium Copper with thick persistent legs. Nose: Alcohol, leather, pomegranate juice, habanero chili. After a while in the glass it settles into a more conventional high-rye bourbon profile. Caramel, jalapeno, and leather continues. On the palate: Surprisingly easy to drink at barrel/bottle proof, but then again it’s a surprisingly low proof out of a barrel. Cherry juice, oak, sweet corn, blackberry, white mulberry, burn. Water brings out sweetness and fruity notes. Finish: Alcohol, caramel, leather. As on the palate, water brings out the fruity sweetness in the finish and tones down the alcohol. Parting words: For the second year in a row, the Four Roses Limited Edition Small Batch has won Whisky Advocate’s American Whiskey of the Year, and with very good reason. Last year’s was very very good, the best since 2009, but this one is even better. It’s a very similar mix of recipes, but with a higher (probably) proportion of bourbon made with the K yeast. It’s older too, which makes its balance of barrel and fruit even more remarkable. As bourbons get into the double digits, they usually get dry and oaky. This one has all the fruit of a young bourbon like Very Old Barton at close to three times the age. It’s a neat trick. It’s balanced, complex, sophisticated and bold all at the same time and it’s one of the best bourbons I’ve ever tasted. These limited edition Four Roses releases are the 21st Century’s answer to Very Very Old Fitzgerald. 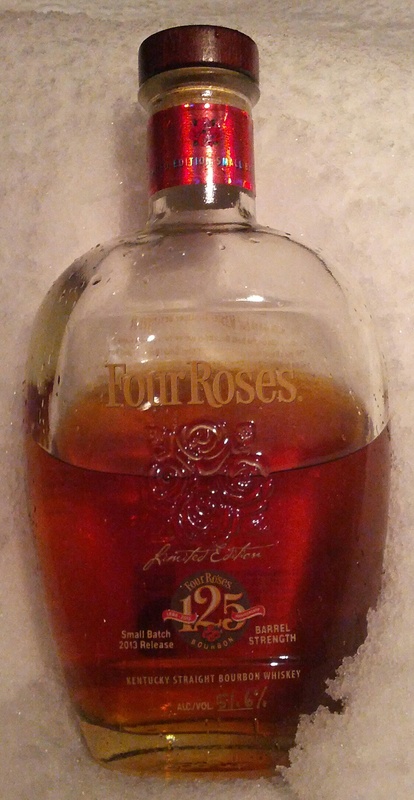 Four Roses is the Stitzel-Weller of now. Unfortunately for those of us who have loved them for a long time, they are starting to be snatched up like S-W. I was able to get several bottles of last year’s release fairly easily, but this year the prices are much higher and the bottles are harder to find, even though they are more widely distributed. If you see one, buy one. If you can get more, get more. If you break your budget buying them, I’d be happy to take a few off your hands. I paid around $90 for mine which is a lot, but worth every penny. Four Roses 125th Anniversary Limited Edition Small Batch is highly recommended.